- The instrument is capable of measuring insulation resistance from 10 KOhm ...999 MOhm. We are the authorise distributor for RISHABH Brand. 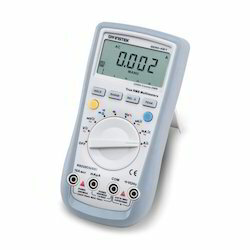 With our committed approach, we have introduced Electronic Multimeters under our product gamut. These meters are designed using latest technology, so that our customers must have accurate performance in the specified applications of measuring voltage, current and resistance as well. Deliveries are made in a convenient way. Our company has achieved widespread recognition in providing Portable Digital Multimeter (Mextech M3900 Yellow Digital Multimeter). Quick and Easy navigation and programming. We are a most trusted name amongst the topmost companies in this business, instrumental in offering high quality array of Digital Multimeter. By keeping track of current market development, we are offering an excellent range of Digital Multimeter. The complete range of analog, digital and analog/digital multimeters provide the solution to electrical and electronic fault finding and testing. The megger range of clamp meters are an invaluable tool, since there is no need to switch off or break the circuit. They offer a safe, non-intrusive way of diagnosing faults on live electrical circuits. Banking on the skills of our qualified team of professionals, we are instrumental in offering supreme quality range of Fluke 287 Digital Multimeter. Banking on the skills of our qualified team of professionals, we are instrumental in offering supreme quality range of Digital Multimeter.